More bad news for millennials. New research suggests that they could become the first generation to earn less than their predecessors. The UK-based study by the Resolution Foundation found that people under 35 earned £8,000 less in their twenties than the previous generation. 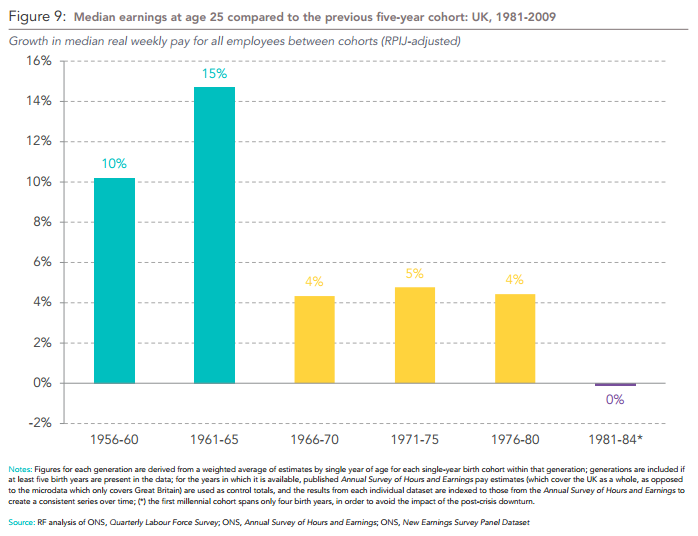 The report argues that millennials (born between 1981 and 2000) have been hit hardest by the “recent pay squeeze”. This has resulted in millennials earning less in their 20s than a typical member of Generation X (born between 1966 and 1980). Under a pessimistic scenario, where future pay follows the same trajectory as Generation X, their lifetime earnings would be around £825,000. This would see millennials also earn less than their predecessors across their entire career. 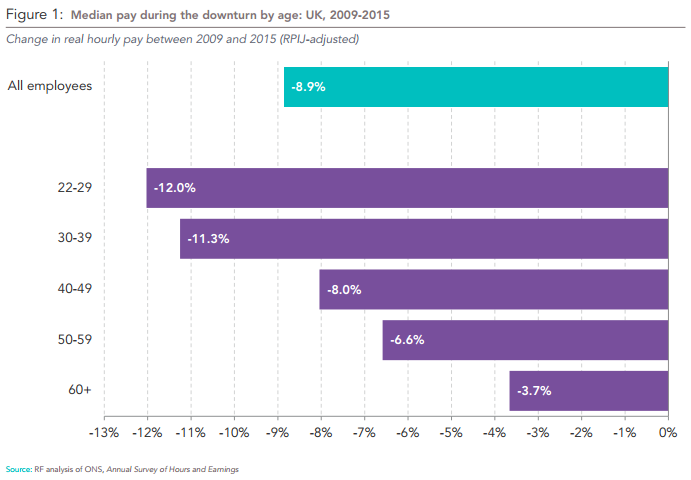 Some of this ‘pay squeeze’ is the result of the financial crisis, as young people entered the labour market during a downturn. But, the report also suggests that progress had stalled before the crisis. As the following chart shows, Generation X experienced slower growth compared to the baby boomers. 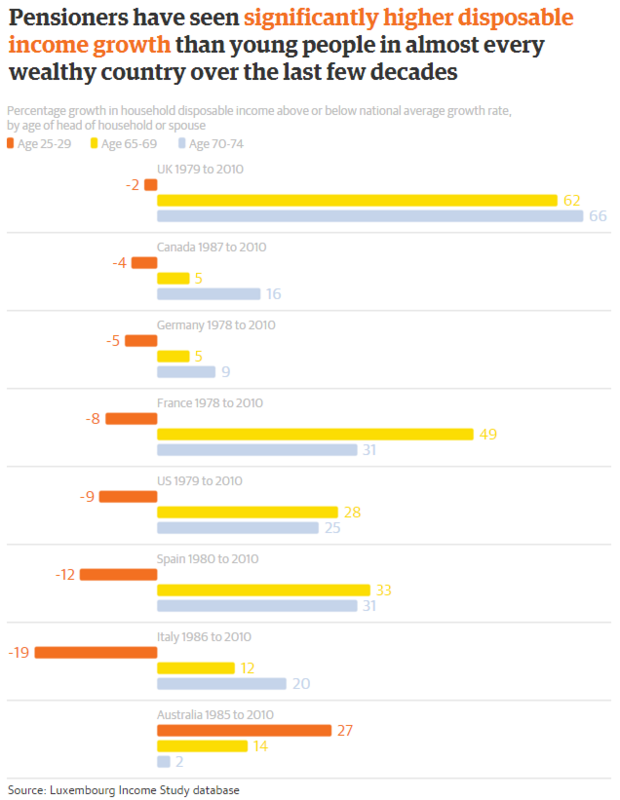 Millennials born between 1981 and 1984 (who therefore entered the workforce before the crisis) experienced no growth. “Generational inequality risks becoming a new inequality for our times, and nowhere is that clearer than on pay,” said Torsten Bell, Director of the Resolution Foundation in a press release. An investigation by The Guardian earlier this year found that inequality is rising between generations across Western economies. Millennials are earning much less than the national average, according to data from the LIS (Luxembourg Income Study): Cross-National Data Center. With the exception of Australia, workers aged 25-29 are earning up to 19% less than the national average. Conversely, prosperity amongst pensioners has risen. “The situation is tough for young people. They were hit hard by the Great Recession, and their labour market situation has improved only little since,” Angel Gurría, Secretary-General of the OECD, told The Guardian in March.